Different fish lineages have evolved a variety of solutions to the challenges of locomotion in water. In the process,mutually exclusive specializations for cruising, rapid starts,or maneuverability have arisen. Different fish lineages have evolved a variety of solutions to the challenges of locomotion in water. In the process, mutually exclusive specializations for cruising, rapid starts, or maneuverability have arisen (see above). The fossil record indicates that similar body morphologies and anapparent trend toward increasing concentration of activity in the tail region have appeared repeatedly during osteichthyanevolution. These patterns and trends all capitalize on the substantial stresses that can be placed on a rigid, bony skeleton and the forces achievable by muscle masses attached directly or indirectly to bony structures. Elasmobranchs are, however, phylogenetically constrained by a relatively flexible and comparatively soft cartilaginous skeleton. Evolution of locomotion in chondrichthyans has, not surprisingly, taken a differentalbeit parallel path. Most elasmobranches swim via undulations, either other body (sharks) or of the pectoral fins (skates and rays).Most sharks swim using anguilliform locomotion, although the amplitude of each wave in the caudal region is greater in swimming sharks than in eels. This exaggerated sweep of the posterior region probably capitalizes on the increased thrust available from the large heterocercal tail of a shark. Exceptions to anguilliform swimming include the pelagic, predatory mackerel sharks, which have converged in body form and swimming type with tunas, dolphins, and ichthyosaurs(see above). Skates and rays also undulate, passing undulations posteriorly along the pectoral fins while the body is held relatively rigid. The exception in this group is the torpedo rays, which differ in that they have an expanded tail fin and swim via ostraciiform oscillations. In these strongly electro genic rays, the pectoral region is unavailable for swimming because it is modified for generating electricity. The mechanics of swimming in sharks are fascinating and somewhat controversial. Three topics have received the most attention, involving the functions of the median fins, skin, and tail during locomotion. Despite anguilliform movement, most sharks are active, cruising predators with relatively streamlined bodies. This would seem anomalous given the relatively low efficiency of the anguilliform mode and the apparent incompatibility of a fusiform body bent into long propulsive waves. However, sharks enhance the efficiency of their swimming mode in several ways. Most sharks have two dorsal fins, the first usually larger than the second, separated by a considerable gap. The dorsal lobe of the pronounced heterocercal tail may bethought of as a third median fin in line with the dorsal fins, again separated from the second fin by a considerable gap. The distances between the three fins are apparently determined by the size of the fins, their shapes, and the waveform of swimming of the fish. Each fin tapers posteriorly, leaving behind it a wake as it moves through the water. This wake is displaced laterally by the sinusoidal waves passing down the fish, so the wake itself follows a sinusoidal path that moves posteriorly as the fish moves through the water. This wave is slightly out of phase with the fish’s movements by a constant amount. Calculations of the phase difference and wave nature of the wake suggest an ideal distance between fins that wouldmaximize the thrust of the second dorsal fin and particularly of the tail. If timed correctly, the trailing fins can push against water coming toward them laterally from the leading fins. Such an interaction between flows would enhance the thrust produced by the trailing fin. Measurements of swimming motions and fin spacing in six species of sharks indicate just such an interaction (Webb & Keyes 1982;Webb 1984). Unlike bony fishes that use their median fins primarily for acceleration and braking but fold them while cruising to reduce drag, sharks use their median fins as additional, interacting thrusters. Sharks are not alone in this interaction among fins. Recent studies on bluegill sunfish indicate that the caudal fin also interacts with the vortices produced by the soft dorsal during steady swimming, thus providing additional thrust (Drucker & Lauder 2001). The energy provided with each propulsive wave of muscular contraction is additionally aided by an interaction between the skin and the body musculature of a shark. Theskin includes an inner sheath, the stratum compactum, made up of multiple layers of collagen fibers that are mechanically similar to tendons. The fibers form layers of alternately oriented sheets that run in helical paths around the shark’s body, thus creating a cylinder reinforced with wound fibers, an exceptionally strong and incompressible– but readily bendable – structure (Motta 1977;Wainwright 1988b). Inside the skin, hydrostatic pressure varies as a function of activity level. The faster the shark swims, the higher theinternal hydrostatic pressure. Pressure during fast swimming is about 10 times what it is during slow swimming, ranging between 20 and 200 kPa (kilopascals: 1 Pa =1 J/m3=1 kg/m/s2). Internal hydrostatic pressure develops from unknown sources, probably due to changes in the surface area of contracting muscles relative to skin area and to changes in blood pressure in blood sinuses that are surrounded by muscle. The shark’s body is therefore a pressurized cylinder with an elastic covering. During swimming, the higher the internal pressure, the stiffer the skin becomes, which increases the energy storedin the stretched skin. Body muscles attach via collagenoussepta not just to the vertebral column but also to the inside of the skin (for this reason, it is exceptionally difficultto remove the skin from the muscle of a shark). As the muscles on the right side of the body contract, muscles and skin on the left side are stretched. The stretched skin is very elastic, but stretched muscle is less so. As muscles on the right side relax, the energy stored in the skin on the left side is released, aiding muscles on the left side at a point when they can provide relatively little tension. Therefore, the skin may act in initiating the pull of the tail across the midline and increase the power output at the beginning of the propulsive stroke. The faster the shark swims, the greater the elastic recoil from the stretched skin. Muscles attach to the relatively narrow vertebral column of calcified cartilage but also attach to the much larger surface area of stiff, elastic skin that encompasses the shark from head to tail and in essence forms a large, cylindrical, external tendon. The helically arranged fibers of the dermis extend onto the caudal peduncle and caudal fin, adding rigidity to both and perhaps storing elastic energy during each swimming stroke(Lingham-Soliar 2005). Muscles pulling on the skin provide propulsive energy that probably exceeds the thrust derived from muscles attached to the vertebral column (Wainwrightet al. 1978; Wainwright 1983). Most of the power in shark swimming comes from the tail, but this tail is not symmetrical as it is in most bonyfishes. The heterocercal tail, with its expanded upper lobe, would seem to provide a lifting force to the posterior end of the body during horizontal locomotion. This lift should cause the body to rotate around its center of mass, plunging the anterior end in a perpetual dive (Fig. 8.3). One long held explanation is that the flat underside of the head and the broad stiff pectoral fins create lift at the anterior end to counteract the downward force. However, it seems inefficient for the tail and the pectoral fins to function against each other, the tail propelling and the pectoral fins continually braking the shark’s progress. Given the 400-million year success of elasmobranchs and the widespread occurrence of heterocercal tails in many previously speciose lineages of both bony and cartilaginous fishes, it is hard to imagine that heterocercal tails are inherently inefficient. This apparent dilemma has prompted an ongoing search for mechanisms that promote relatively straightforward propulsion. 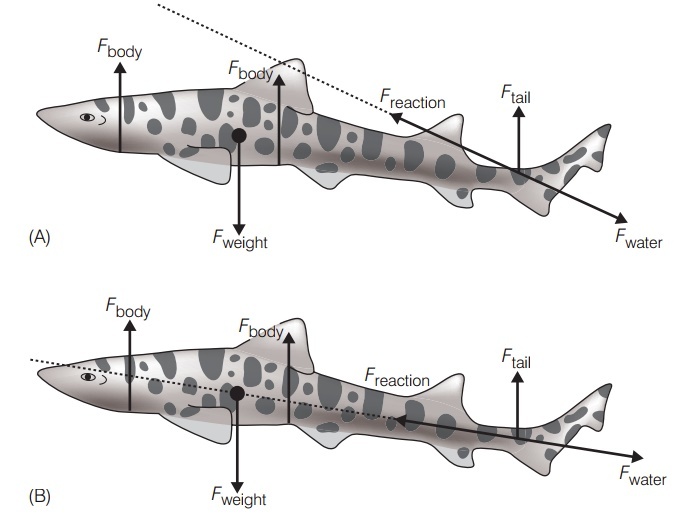 The two competing models that explain how horizontal locomotion is accomplished in sharks. (A) The modified classic model interprets the shape of the heterocercal tail as generating a downward and backwards thrust (Fwater), lifting the tail up (Ftail); these produce a resultant force(Freaction) that moves the body upwards and forwards. The flattened ventral profile of anterior body regions also provides lift (Fbody). Freactionplus Fbody counter the shark’s tendency to sink because of its negative buoyancy (Fweight). The result is horizontal swimming. (B) In the alternative Thomson model, the upper and lower lobes of the tail provide counteracting forces that drive the fish directly ahead. The most recent research supports the modified classic model. However, the alternative model appears to explain locomotion dynamics in sturgeons, which also have heterocercal tails but which – unlike sharks – vary the flexibility and shape of dorsal and ventral tail lobes (Liao & Lauder2000). After Wilga and Lauder (2002). The search has turned into something of a debate. The classic model, as described above, proposes that the tail pushes back and down, creating a reactive force that causes rotation around the center of mass that is countered by head shape and pectoral fins. An alternative explanation, based on interpretations of photographs and selective amputation of fin parts of tails held in a test apparatus(Simons 1970; Thomson 1976, 1990), suggests that forward thrust is generated through the center of mass by differential movements of the upper and lower lobes of the tail (Fig.8.3B). The classic model appears to be the most accurate description and is supported by video analysis (such as digital particle image velocimetry) and dye-tracer studies using free-swimming animals (Ferry & Lauder 1996). The classic model has been modified because shape and body angle, not pectoral lift, generate lift forces that are added to the lift exerted by the tail (Wilga & Lauder 2002). These forces are equal and opposite to the weight of the shark in the water. Braking by the pectoral fins is unnecessary. The answer to how sharks climb, dive, and turn – rather than pivoting around their center of balance or rising in thewater column – probably lies in their ability to continually adjust the relative angle of attack of their pectoral fins rather than altering thrust direction resulting from tail movement (Wilga & Lauder 2002). Maneuverability in bony fishes usually involves deep, compressed bodies and the use of median and pectoral fins; to accelerate, bony fishes increase the frequency of their tail beats. Sharks, with their streamlined bodies and relatively rigid fins, have taken a different evolutionary path to achieve maneuverability that may involve tail fin dynamics and paired fin adjustments. Sharks change speed by altering tail beat frequency, but they also vary tail beat amplitude and the length of the propulsive wave passing down their body (Webb & Keyes1982). Sharks have taken the relatively inefficient anguilliform swimming mode imposed by their flexible bodies, and combined elastic skin, rigid but carefully spaced median fins, and a heterocercal tail that produces a constant direction of thrust to achieve an efficient compromise between cruising, acceleration, and maneuverability. The actual mechanics of swimming in sharks and bony fishes is still a matter of debate and research, but our growing understanding underscores the intricacies and importance of locomotor adaptations in fishes.